We are not formally associated with the church conflict intervention services offered by these organizations, so you will need to investigate each organization thoroughly to determine whether it might be a good fit for your needs. 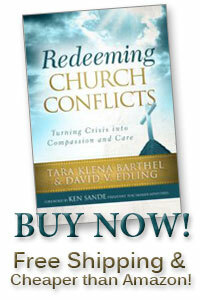 (We have an entire Appendix in Redeeming Church Conflicts to help you with this task: Selecting an Outside Third-Party Church Conflict Consultant.) Download a FREE PDF of this Appendix here.